The publicity material reminds us that the aim of non-church music up to and including the time of Mozart was often to entertain and this new recording certainly contains a range of music which, in the right hands, does just that. What could be more enjoyable than K525 or a better work for winding down in the evening than K239? The problem here is that Camerata Nordica are not content to let the music speak for itself. Best known for their recordings of new and recent works, they seem to think that Mozart needs to be re-interpreted for modern listeners. They are at their best in the opening K456 which they justifiably make sound almost like an Elgar or Stokowski orchestration of a Bach work. In the lighter works which ensue, just in case we miss the point, they often insert ‘meaningful’ pauses or scramble the tempo – far too fast in places. The decision to ‘explore … Mozartian playfulness [by] allowing a plaintive Swedish nyckelharpa (‘keyed fiddle’) to be heard in the trio section in Eine kleine Nachtmusik and giving the timpanist an opportunity to rock the party in the closing rondo of Serenata notturna’ might, in other circumstances have been fun, but I found these simply annoying. The result is the antithesis of the way in which the likes of Willi Boskovsky with his Viennese team gently nudge the music into shape. 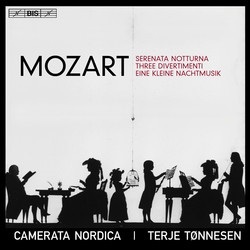 His recording of K525 and K239 on a Double Decca twofer (4434582) is now download only and more expensive than when it was on CD but it offers a model of how to play these works which Camerata Nordica would have done well to heed. The very fine Philips twofer with the Academy of St Martin’s is also download only but more reasonably priced (E4640222). It’s also available as an inexpensive Eloquence twofer: 4804722. Best of all, however, for my money is another Eloquence recording featuring Peter Maag’s K239 with the LSO together with his mono and stereo recordings of Mozart symphonies – review. It’s well worth putting up with the dated sound in the earlier items for Maag’s ideally pointed Serenata Notturna and Symphony No.32. I also liked the Beulah reissue of Maag's OSR recording of the 'Posthorn' Serenade - review - and I hope to see that reappear on a future release. Further suggestions for some or all of this repertoire can be found in my Download News 2014/4: Karl Böhm (DG), Andrew Manze (Harmonia Mundi), Petra Müllejans (also Harmonia Mundi, budget-price) and the Drottiningholm Ensemble (BIS). Some recent Beulah reissues, reviewed in my Summer_2017_2 article, also make timely comparisons. Though lacking the last degree of panache, the Vienna Soloists with Wilfried Boettcher outperform Camerata Nordica in Eine kleine Nachtmusik, with Divertimento K318 and a selection of Dances, together with Josef Suk and Milan Skampa in the Sinfonia Concertante, and two albums of late Mozart symphonies directed by Sir Thomas Beecham show how to play around with his music and more than get away with it. The very good BIS recording and the high quality of the playing serve only to emphasise my overall disappointment with these over-‘interpreted’ performances, which matches that of Kirk McElhearn, reviewing an earlier Camerata Nordica recording of Beethoven.